Yamaha YXZ 1000R front sway bar kit. The YXZ is a very good handling UTV from a turning stand point. This is very evident by the success they have had in Lucas oil short course racing where turning is most important. Now we are making available to, you our custom, tune able front sway bar system the teams have been using. 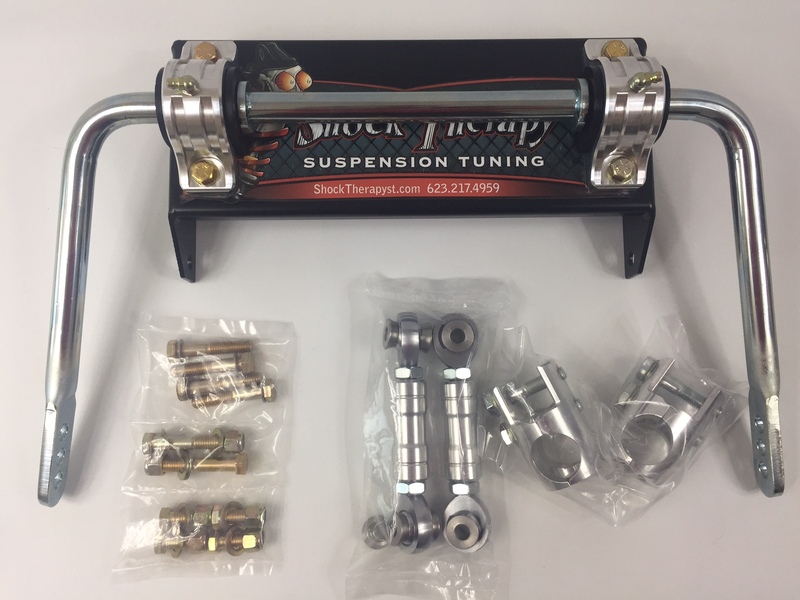 This front sway bar system is completely bolt on and attaches to the front frame section inside of the factory front bumper if you still use it. It clamps to the factory lower A arms with billet 7076 clamps. The factory front sway bar is minimal help at best and as you enter a corner hard you will find the YXZ diving onto the front outside tire and picking up the inside rear tire before you hammer the gas and get the car to take a set. With our front sway bar system, this front corner dive is eliminated and you can raise your corner entry speeds as well as keep the rear tires planted for maximum traction throughout the corner. It also has 3 hole positions for the links. This way you can tune into your car how much from sway bar help you want for different tracks. Tune the bar for YOUR driving style. There is no question that this front sway bar system is the single biggest advancement in cornering you can do to a YXZ. I guess I was the first trying this, and I love it! now I can do corners a lot faster and have more stablity than a can am x3, LOVE MY SWAY BAR! Click the button below to add the Yamaha YXZ 1000R front sway bar kit to your wish list.